Detectives investigating the murder of a teenager shot dead in his bedroom said they have "established a link" with a fatal stabbing at the weekend. Michael Dosunmu, 15, was murdered by two gunmen in Diamond Street, Peckham, south-east London, in the early hours of Tuesday. Police say the church-going teenager may not have been the intended target. 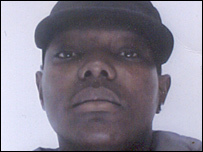 It is being linked to the death of Javarie Crighton, 21, on Saturday, in Southampton Way, near Michael's home. A Metropolitan Police spokesman said: "We can confirm we have established a link between the fatal shooting of Michael Dosunmu on Tuesday 6 February in Peckham and the fatal stabbing of the 21-year-old man on 3 February." Officers said they were sure Michael's house was specifically targeted, but were investigating whether the 15-year-old was killed in a case of mistaken identity. Michael's older sister was in at the time. She gave him first aid and he was able to say a few words to her. He died less than an hour later in hospital just days after celebrating his 15th birthday. He was a regular at the Celestial Church of Christ, in nearby Bird In Bush Road, and attended St Michael's Secondary School, in Bermondsey. Pastor Julius Shebioba from the church spoke to the boy's father. "He was completely taken aback, naturally. That boy was loved by everybody." Officers from Scotland Yard's Operation Trident team, which investigates gun crime in London's African-Caribbean communities, have not found any link between the boy and local gangs. 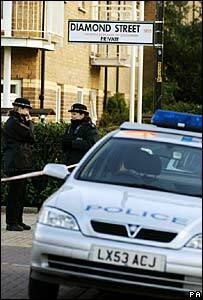 Det Supt Gary Richardson, from Trident, said: "This does not appear to have been a botched burglary. I believe these premises were specifically targeted." Orando Madden, 23, of Wodehouse Avenue, Peckham, has been charged with the murder of Mr Crighton who was stabbed over the weekend. He has been remanded in custody to appear at the Old Bailey on 16 May.